It starts with the voice. One day we hear its strange, broken glory, and before long everyone else in our lives would rather jam icepicks into their ears than listen to another Bob Dylan song. We know what you’re thinking. That the man cannot sing, that he yelps, grunts, and caterwauls, that he sounds like a suffering animal or a busted lawn mower, that his throat is a rumbling, grating cement mixer. How can we ever explain this so you understand? Dylan’s voice, so reviled and ridiculed by you heathens, is a wonder of the world to us. It’s human, real, and above all expressive. It embodies rapture, heartbreak, rage, bitterness, disdain, boredom. It can be by turns biting, sarcastic, and deeply funny. It’s freighted with weirdly spellbinding magic. It’s what pulls us—the faithful—to the foot of the stage, and keeps us there for a lifetime. We who listen too hard are compelled to do things that are difficult to talk about. We devour millions of words of scholarship on his life and work. We spend hours arguing about the songs. We celebrate new albums as important events; they help us mark time in our own lives. We manage towering collections of bootlegs and hunt down underground tapes. We find ourselves identifying with him, and quoting his choice lines in conversation. Some of us have been known to wake up in the morning and wonder what he’s eating for breakfast and how he takes his coffee. We go off on pilgrimages: stomping through the timeless Greenwich Village streets where he first made it in 1961; trekking to Big Pink in Woodstock, where he set down beloved reels of classic Americana with The Band in 1967; popping into a café linked to Dylan in Santa Monica; driving past his estate in Malibu; peeking down the long driveway to his farm in Minnesota. We go to concerts by the dozens, and wait in lines all day so we can dash to the front of the stage. We bet on which songs he’ll perform at the show tonight. We keep track of everything: every recording session and every tour date, every song on every bootleg, every word ever caught by a recording device. We are preoccupied with facts and dates, as if cataloguing these things will solve the mysteries of his life, and ours. We investigate the unanswered questions of his career. We pile up pages for Dylan books and Dylan fanzines and Dylan blogs, or just for our own private circles of Dylan friends. We go to conventions and tribute shows and meet-ups and lectures. We figure out how to play the songs on our guitars. We track down all the literary, musical and cultural allusions in his work. We collect the things he left behind: scraps of writing paper, guitars, harmonicas, books, cigarette butts. One day we discover with a flash that more than a few of our closest friends, sometimes even our spouses, are fellow fans. I first found Dylan in the dusty basement of my childhood home. In the summer before my junior year in high school I was flicking through a pile of vinyl left behind by my older brother. I found a heavy box with five records inside. The man glowering on the front cover looked like he didn’t take orders from anybody. I liked that. I pulled off the top of the box, slid one of the records from a sleeve, fitted the vinyl onto the turntable, and dropped the needle into the groove. The music started, and a switch flipped in my head. The album was called Biograph, a retrospective of the first two decades of a recording career still very much in progress. Dylan’s folk ballads were jumbled together with wailing mid-1960s rock classics, his gospel songs shared space with tomfoolery. A maid is beaten to death. A good man is sent to jail. A husband abandons his wife to hunt for treasure with a shadowy figure, and all he finds is an empty casket. There were songs about girls, and war, and politics. I didn’t know who all of the characters were: Johanna, Ma Rainey, Cecil B. DeMille, Gypsy Davy. I couldn’t honestly say I knew what Dylan was saying half the time. But the lines were riveting. I wore out those five records. I learned every word and made them mine, and Dylan grew into an outsize figure in my universe. I preached the gospel to anyone who would listen. I loaned Highway 61 Revisited and Blood on the Tracks to friends, or played Dylan for them in my car. I expected them to see the light and join the congregation. But it wasn’t 1965 anymore. Dylan’s Ray-Ban cool had worn off. When I tried to play “Subterranean Homesick Blues” on the boom box during a school bus trip, my classmates yelped in protest. They couldn’t get past the voice. For the longest time, I felt alone in this addiction, and a little crazy. No one in my world took Dylan as seriously as I did. But it also seemed as though I was in on a secret. In time I came to realize that there were many others like me—an entire underground nation of unreformed obsessives. I had a people. One day not long ago, I set out to meet them. The little Minnesota town that Bob Dylan fled in 1959 is a hundred miles shy of the Canadian border. From the Twin Cities, it’s three and a half hours by car, due north past fields and silos and a hundred lakes. Maps show crossroad towns, Sax, Independence, Canyon, but look out the car window and there is little proof they even exist. The thick woods are remote enough to hold moose. In the winter, when temperatures can drop below zero overnight, a stranded driver has reason to fear that frostbite will arrive before the tow truck. Dylan’s followers make the pilgrimage en masse to mark his birthday each year, and lucky for them he was born in May. They only have to deal with a heavy splattering of bugs on the windshield. The capital of the Land of Bob is Hibbing, quintessential iron-mining town, population sixteen thousand or so. They know they’ve made it when the off-road ATV shops, biker bars, and broken-down rural miscellany give way to the regional airport and other markers of modern civilization: Super 8, Walmart, KFC. A commercial district encircles a grid of avenues lined with modest houses and tidy lawns. Howard Street, broad and bedecked in two-story red brick, is the major artery of a drowsy downtown well past its prime. It has a jeweler, a bookseller, a bank, the Moose lodge, a knitting shop. Every other block seems to have a vacant storefront standing out like a missing tooth. The drinking crowd is liable to make a scene outside the Bar 412 in the wee hours. Otherwise, hush. A lifetime on, the boy these pilgrims hoped to find was a ghost. Still they trekked all the way up into the North Country to look for traces of his past life. As it happened, so did he. On the day they sent Myrtle off to the hereafter, Bob Dylan was back. On Sept. 23, 2004, a Thursday, one of those golden mornings in early autumn, a social worker named Bob Hocking was at his desk in the Hibbing employment office when the telephone rang. It was his wife, Linda. Ordinarily, she would have been over at Zimmy’s, her Dylan-themed bar and restaurant on Howard, where the pilgrims can order a “Hard Rain” hamburger while they chew on the delicious idea that as a teen Bob bought LPs just up the street at Chet Crippa’s Music Store. But this morning Linda was three blocks south at Blessed Sacrament for a funeral. Myrtle Jurenes, ninety-two, was dead. Hibbing being Hibbing—that is, Dylan’s childhood hometown, and the sort of place where everybody knows everybody else—Myrtle was the mother of a Hocking family friend, and she was Dylan’s brother’s mother-in-law. “Bob’s here,” Linda told her husband. She suggested he get over to the restaurant just in case. Maybe Dylan would hang around after the service. Maybe he would want lunch. Maybe he would come by their joint, finally. One of them ought to be there, you know, just in case. Hocking jumped in his pickup truck and was at Zimmy’s five minutes later. They had not been expecting Dylan to make an appearance. He spent a quarter of every year playing dates in North and South America, Europe, Asia, and Australia. He had homes around the world. But he also owned a farm on the Crow River just north of Minneapolis, and stories circulated every now and then about local sightings. He had been spotted at Minnesota Twins baseball games, and in Duluth. Once, decades ago, he drove up to Hibbing in a station wagon with an enormous dog and pulled right up to his boyhood home. The owner invited him inside. Dylan, wearing a leather jacket and boots, asked after some teachers, noticed where he’d carved his initials onto a basement wall, and marveled about how small his bedroom really was. Now, on the day they sent Myrtle off to the hereafter, Bob Dylan was back. Linda was sitting in the back of the church when she spotted that legendary nimbus of hair halfway to the altar. That can’t be Bob, she thought at first. But she kept watch, and when he turned his head, she had no doubt. He was sitting beside a woman with long, straight blonde hair and a skirt that went down to her ankles. Afterward, he milled around with other mourners on the patio in front of the church. Linda noticed that his suit was well-made, and he looked rested and healthy. He made his way over to speak with his high school English instructor, B.J. Rolfzen. The Hockings had become very close to the old retired teacher, so Linda sidled up as if she belonged. He looked at his Italian leather shoes, then over at his old house down the street. His aunt came by and reminded him to stop in on his uncle, who was ill. Linda was just about to introduce herself and invite Dylan to lunch at Zimmy’s when she saw him peer over her shoulder. A stunned look crossed his face. A local TV crew had appeared, and they were racing over with their camera and microphone. She turned back and Dylan was gone—running across the lawn. He jumped into the driver’s seat of his Ford pickup and disappeared. In a flash, Linda’s moment with the singer was shot. Meanwhile, over at the restaurant, Hocking paced the floor, chatted with the waitresses, looked out the window. Zimmy’s was on the corner of Howard and 6th Avenue East, right in the middle of downtown. In the 1920s, the building housed trolley cars that ran along Howard Street; original tracks are still there in the basement. Around Dylan’s time it was a Shell station. Now it had the exposed brick and always-on televisions of an Applebees in Anywheresville, except that the cartloads of bric-a-brac were authentic Dylan artifacts. Hocking, who had a ramshackle gait and was more than capable of holding up both ends of a conversation, went to Hibbing High a decade after Dylan left, but he grew up taking the celebrated alumnus for granted. It wasn’t until he left that he realized how revered the man was everywhere else. In St. Paul, his first stop out of high school, other students spoke of Dylan like a minor god. Just being from Hibbing made Hocking a person of interest. So he listened harder to the records, and soon he caught the bug. If he comes, Hocking thought, I’m here. He had never run into Dylan, and now, with the possibility hanging in the air, he was anxious. His mind raced. He worried about what he would say. He ran through the scenarios in his mind. He didn’t want to be one of those tongue-tied fans. Hocking was well-versed in local history, and knew just about everybody in town. He could fill Dylan in on the times gone by. He figured he’d play it cool. Welcome to Hibbing, let me buy you lunch, if you have any questions about anything, I’ll be around. It was a long shot, of course. He knew that. Given Dylan’s half-century of public churlishness, you would have to assume he would never go near a place named after him, that had a faux Hollywood Walk of Fame star on the sidewalk and a menu featuring a “Simple Twist of” Sirloin ($15.99). A place that was liable, any day of the week, to have some crazy Dylan fan on the premises, some all-knowing Dylanologist ready to pounce and pepper him with questions. Still, crazy things happened, and Hocking couldn’t help but imagine it. 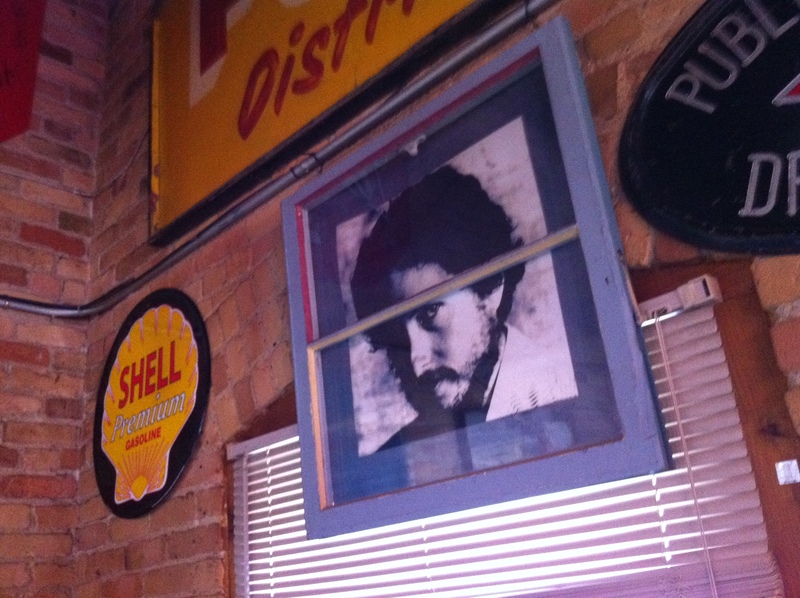 Bob Dylan inside Zimmy’s. Gazing from photographs on a towering billboard sign out front were Bob Zimmerman, age seventeen, holding an electric guitar, and his high school girlfriend, Echo Helstrom, posing for a glamour shot. A cardboard cutout of sixty-ish Dylan greeted diners inside the front door. He had a thin mustache and a white cowboy shirt open three buttons from the collar. On the walls were guitars and posters, a Highway 61 road sign, and images of Dylan from the 1940s and ’50s. Bob on a motorcycle, Bob at his mother’s feet as a toddler, Bob holding a drum he made in middle school. In one photo, a first-grade class portrait, every child looks at the camera except him. He had turned his head at the moment the shutter clicked open. Across one wall was a sign spelling out, in vintage yellow light bulbs, LYBBA. It’s an obscure name that only locals should recognize, but the pilgrims who go to Hibbing with Dylan on the mind, the ones who wander around Zimmy’s like they’re at the Metropolitan Museum of Art—staring, pointing, their mouths agape—these people know the name straight away. Lybba Edelstein was Bob Dylan’s great-grandmother, and her husband, B.H., named one of the family’s movie theaters after her. Zimmy’s has bits of Dylan’s childhood house. The most recent owners replaced nineteen windows and passed along the original ones to various Dylanophiles. “It’s like the four thousand fragments of the true cross,” one fan said. Here and there around town you find the windows, as if they could reveal what went on behind them when they were in Bob’s house. One sash went to a guy up the highway who named his sons Bob and Dylan. A Minnesota folksinger got one, the library got one. Zimmy’s had to have two, and the Hockings wanted theirs to be the windows that hung in the boy’s bedroom. They also owned bits of bathroom tile from the house, and the bathroom sink, and the door to his high school English classroom. These old things were a concrete link to the real Bob Dylan, and the Hockings still felt a tiny charge when they thought about him walking the streets of the town they called home. Bob and Linda met as art students in Missoula, Montana, in the early 1980s. Not long after they arrived in Hibbing, he landed work with the state and painted, mostly abstracts. She got a job as a manager at Zimmy’s. Only it wasn’t Zimmy’s yet. Back then it had an instantly forgettable name, the Atrium. A few years after Linda arrived, the owners decided they needed to rebrand or else they would struggle like any other downtown restaurant. At a brainstorming session, Linda brought up Dylan. Surely, he would be a better draw than other celebrity Hibbingites, like attorney-author Vincent Bugliosi, or Jeno Paulucci, the man who behind Chun King canned Chinese food. “I don’t think you realize how big Bob Dylan is everywhere but Hibbing,” Linda argued. The owners were sold, and the new name went up on the signs. Linda got an informal green-light from Dylan’s office, but she worried that people would say the business was cashing in on a superstar’s celebrity. Sure enough, a couple of local women appeared to scold them. Beatty would not approve. Beatty Zimmerman was Dylan’s mother. She had moved out of town after her husband’s death decades earlier, but she returned regularly. A few months after the name change, she was in town visiting friends. They stopped into Zimmy’s for lunch. Linda watched Beatty go from table to table greeting people. She seemed to still know everyone in town. After Beatty sat down to eat, Linda walked over. The Zimmy’s manager is round-faced and perpetually smiling. She grew up in a big city—Philadelphia—but she has the warmth of a small-town girl, a workaholic’s industry, and the mind of a natural born marketer. She introduced herself and asked Beatty what she thought. Dylan was an eccentric and sensitive kid. Perhaps he wouldn’t have fit anywhere, but growing up, he surely didn’t fit in Hibbing. Later on, after he became famous, writers and critics used to wonder: How did a cultural giant as smart and original as Dylan come from a nowhere sort of place like this? Over the years, pilgrims to Hibbing were surprised that Dylan was not hailed as a local hero. A visitor could come and go and never realize the connection. Wear a Dylan T-shirt in Hibbing and you were liable to get an earful from the locals about how much they wanted to pummel that no-good weirdo when they were growing up. After Dylan landed his record deal—only two years out of high school—he fabricated a new biography for himself. He told interviewers he’d run away from home repeatedly. He’d lived in Gallup, New Mexico, and Marysville, Texas, and Sioux Falls, South Dakota. He’d been a “roustabout” for carnivals. In Hibbing, people couldn’t understand why Dylan went to such lengths to deny growing up middle-class in their respectable city. What his high school girlfriend, Echo Helstrom, remembered was being bullied for something like twelve years. She spent a lot of time being angry at the world. She had to laugh when she thought about the glamorous photo of her up on the sign at Zimmy’s. There she was, looking down at all the people who were mean to her growing up. After school, after moving to California and finding a job in the film business, Helstrom never considered going back. Yet, weirdly, Hibbing still had a hold on her. “My heart just can’t leave it and be done with it. It’s still home to me.” Although they did not stay in touch, she suspected Dylan felt the same. Still, she can’t imagine Dylan coming to Hibbing for some grand homecoming, where he could be feted as a hometown hero. Bob Hocking’s grand fantasy was that Dylan would visit for a farewell concert at the high school theater, but it’s safe to say something like that is not going to happen. It’s a crazy idea—as crazy as thinking that Dylan would drive over to Zimmy’s one day, stroll in the front door with a smile, and order up the “Slow Train” veggie pizza ($8.49, gluten free!). You should know something about Bob. He doesn’t wear shirts bearing his own likeness. But that afternoon in 2004 after Myrtle’s funeral, Hocking could not help himself. He had to hope. Maybe, maybe, maybe. Maybe. Then he saw it: a news truck parked right next to the restaurant. He saw it, and he knew. No way Dylan would run that gauntlet. The cameramen were inside eating lunch, but Hocking didn’t ask them to move their van to a less conspicuous spot. Customers were customers. Instead, he hung around until one, watching and waiting, then gave up and went back to the office. He shrugged it off. If it wasn’t meant to be, it wasn’t meant to be, and anyway, sometimes the fantasy was better than the reality. Later, word came back that Dylan stopped in on his uncle before departing. There was some excitement at Zimmy’s when Dylan’s nephews walked in for lunch and hung around for a couple of hours. Linda, just as she had done with Beatty a decade earlier, chatted and handed over a bunch of Zimmy’s swag. When she offered them a shirt to give to their uncle, they laughed. You should know something about Bob, they explained to her. He doesn’t wear shirts bearing his own likeness. Six years on, Dylan turned up again, and this time the Hockings had no clue he might appear. He arrived with a woman nobody recognized. They looked at the school and the family movie theater and some other sites. But, again, Zimmy’s was not on the itinerary. On the outskirts of town, Dylan and the woman stopped into a coffee shop. A friend of Bob Hocking’s happened to be there. “I know who you are,” he told the singer. “You’re that Bob Dylan guy.” He left with an autograph on a napkin. By the time word got back to Hocking, Dylan was gone—just a rumor. It was a Friday in May 2009, and Colin Hall had just finished showing tourists around John Lennon’s childhood home in Liverpool, Mendips, for the nineteenth time that week. One more showing before the weekend. Usually at the end of a tour, Colin sent visitors outside to wait for the shuttle bus to take them back to their cars, but it was a bit chilly out, so he let them stay inside this time. The curator figured the man was having a joke at his expense, or as they say in England, taking the mickey. 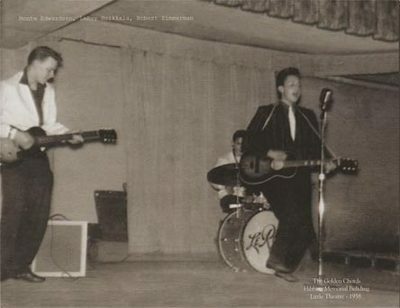 Dylan was performing that evening in Liverpool. But when a friend had asked Colin whether he thought the singer might stop in, he had laughed and laughed. Now Colin led the tourists out of the house to the gate, and there he was. Dylan had appeared unannounced at the Tudor manor house where the minibus picks up tourists for the three-mile trip to Mendips. He’d gotten on at the last minute with an entourage of three. Two women from North Wales on a shopping and sightseeing trip were in the back row of the bus, and they hadn’t gotten a good look at Dylan, who was wearing a leather jacket and a sweatshirt with the hood pulled up. But the bus driver recognized him immediately. He was as dumbfounded as they were. Colin, a retired school teacher, was a Dylan fan. But he also had done some music writing, and he had met a few big musicians, so he quickly resolved to be a professional. He was not going to let himself disintegrate and become a gushing fanatic. He would treat Dylan like every other paying customer and give him a standard group tour. But the women stopped him. You should show him around privately, they said. We’ve got a story we can dine out on. So for about forty minutes, he walked the special guest through the home where Lennon lived from ages five to twenty-three with his Aunt Mimi. 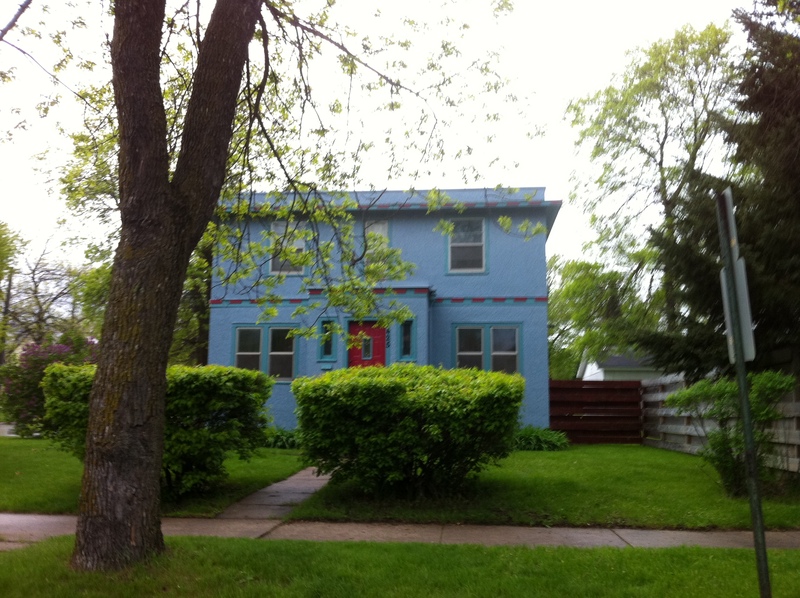 Dylan remarked how much the place recalled his own home in Hibbing. He wanted to know where Lennon and Paul McCartney would play, and Colin led him to the living room where the Quarrymen were allowed to rehearse on Sundays, and to the tiny glazed porch where the echoing acoustics pleased the kids. Dylan did a sideways shuffle-hop into the kitchen and then back. In the kitchen the floor was tiled in small black-and-white squares. The gas cooker and the crockery and the washing powder were all straight out of the late 1950s. “This kitchen, it’s just like my mom’s!” he said. A lot of visitors felt that way. Mendips was restored to look the way it did the year Lennon and McCartney met, so for people of a certain age, the place brought them back sharply to childhood. Many people cried. “Their own past comes up to meet them,” Colin said. The group went upstairs to the bedroom where Lennon read, drew, wrote poems and played his guitar. Looking at those single-pane windows, the Minnesotan imagined how cold it must’ve been up there, just like it had been in his bedroom. Dylan asked about the books on the shelves and on the candlewick bedspread, and Colin told him about Just William, an English children’s series Lennon loved about the misadventures of a troublemaking child. For a moment, it was dizzying. Colin could hardly believe it. He was standing in John Lennon’s bedroom talking to Bob Dylan about a book that was as English as cricket. Every Dylan appearance in the real world generates discussion in fan circles, and this sighting seemed to say something surprising: Dylan understood! Surely he understood what his fans were feeling. Surely, he got the sentiment that sent pilgrims to his hometown time and again. He’d felt it himself. When Dylan set out for New York in 1961, it was as much as a pilgrim as a budding musician. At 19, he had fallen under the spell of Woody Guthrie, the Oklahoma drifter who penned “This Land Is Your Land” and more than a thousand other songs, the dust bowl radical who agitated on behalf of the downtrodden and sometimes played a guitar that bore the words, THIS MACHINE KILLS FASCISTS. Listening to the records for the first time felt “like a million megaton bomb had dropped,” Dylan would write, “… like the record player itself had just picked me up and flung me across the room.” He read the book (Guthrie’s autobiography, Bound for Glory), perfected the sound (Okie), adopted the appearance (work clothes), and swiped the stories (ridin’ the rails). Then, learning that this mythical folk hero was actually still alive, Dylan hitched a ride east to meet him. But their encounter opened the young upstart’s eyes to something, an uncomfortable truth about fandom. What he learned from Guthrie in the flesh was that heroes were not gods. They were just men, as flawed as anyone. A few years later, when the tables were turned and Bob Dylan became famous the world over, sought after, idolized, labeled a prophet and a guru, he tried and tried to get his flock to see things his way. From the very start, it was a losing battle.